A triple shot of high profile wide releases open up the Christmas week release slate in the typical staggered fashion, and in what promises to be a highly lucrative holiday season in all comparisons except to last year. Opening up the slate of Wednesday releases is Sing, a family release that may prove to dominate that audience across the week even as it's one of the laziest concepts in animated film ever. Set in a similar world to Zootopia, it stars Matthew McConaughey as a koala talent scout who decides to put on a talent competition in order to save his theater - basically making it American Idol, but animated. Big stretch for the script, there. In addition to McConaughey, the cast it boasts is fairly impressive, with Reese Witherspoon the showcase star as a housewife pig who dreams of being a singing star. As well, Seth McFarlane, Scarlett Johansson, Taron Egerton, Jennifer Hudson, Nick Offerman and John C. Reilly pad out the cast, potentially enticing in the all-important adult audience despite being pretty threadbare overall. 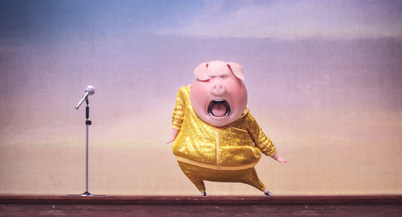 Reviews are solid if unspectacular and the animation... adequate, but its placement at the holidays and the fact that kids are suckers for singing animals (it's basically a segment from The Muppets stretched out to feature length) could propel this one to some success. I'd look for about $19 million before the weekend and around $42 million over the Christmas holiday weekend. Falling victim to the high-expectations game is likely to be Passengers. Starring Chris Pratt and Jennifer Lawrence in a sci-fi film, it's basically like the Internet had a baby. Pratt stars as a crew member of a generation ship, one designed to take its passengers to a new planet while in cryo-sleep. Unfortunately, he's woken 90 years too early, and faced with the notion of dying alone, wakes another passenger (Lawrence) to help him from going insane with loneliness. This goes on until they discover that something is wrong with the ship and there's a reason this all went down.